It has been my experience that those moments in which I find myself in an encounter with the eternal are seldom (probably never) the result of my own effort. Instead, the One who is eternal chooses how, where and when to manifest himself on exactly the right frequency to break through the noise in my life to deliver his message to me. God’s effort. God’s presence. God’s message. And most often, that message is at once both bare simplicity and infinite complexity, such as when he said to Moses, “I am that I am.” The simple stuff, I can usually grasp. The complex stuff will take forever. One encounter happened to me in the Fall of 1973. I was in the student union at the University of Arkansas walking through an exhibition of Japanese wood block prints when I was literally brought to tears by a work of art. I have seen a pretty fair share of “religious art” done over 20 centuries, often in class or study, but many times even in person. Rodin’s Gates of Hell, full-scale replicas of Michelangelo’s David, (decidedly the King of Israel, but perhaps done in secret homage to Paul’s message to the “troublemakers” in Galatia), numerous depictions of the martyrs, endless Madonna and Child paintings, images of the resurrection, etchings of Paul’s conversion on the road to Damascus, Rembrandt’s sketch Walking to Emmaus, icons, Gothic architecture, Dali’s “floating crucifixion” and Last Supper (a pale satire on Leonardo’s Ultima Cena) and even the purportedly inspirational paintings of Thomas Kinkade. 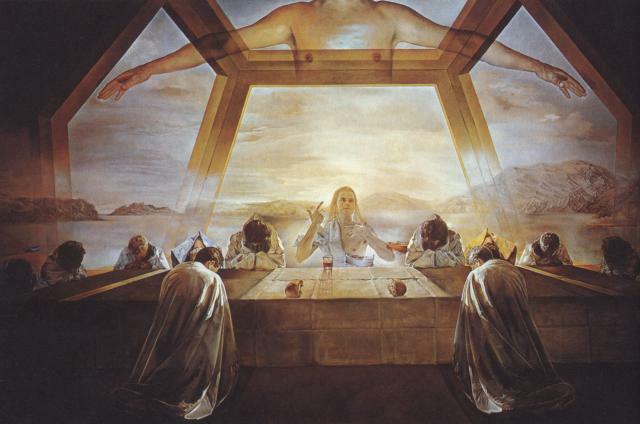 All works of art, some exquisite and evocative—some not so much—all capable of inspiring a degree of connectedness to the Almighty. Many of those works of art were and are quite moving. But in my case, a simple wood block print, created as part of a “traditional documentary and disciplinary exercise” managed to speak more immediately to my spirit about the reality of God’s existence, his presence and his love than any work of art I have ever seen. “The Spirit welcomes you into the margins, into the liminal spaces far away from the doors of the church. And yet there you will be met by a Shepherd/Artist who will guide you into a wider pasture of culture. He will guide you into the night skies in which the sun and the moon are held together by his hand. 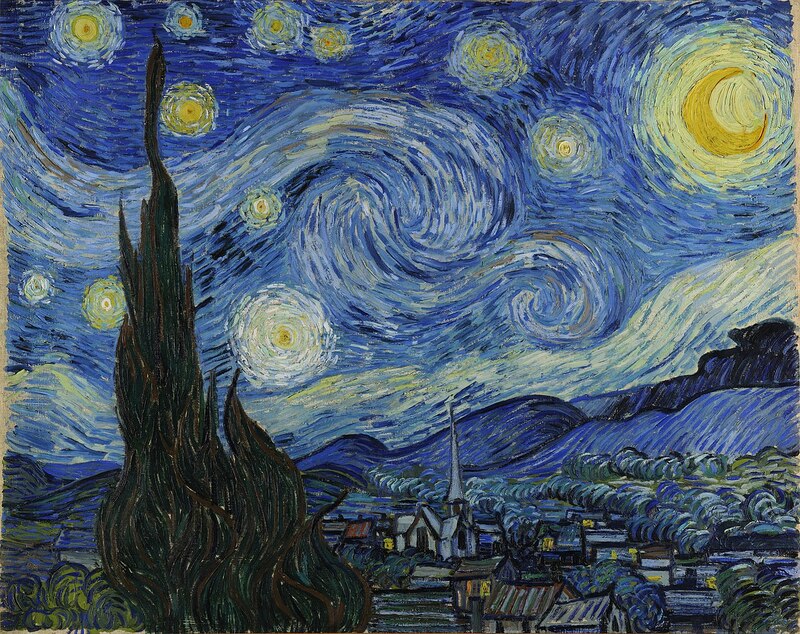 Create in Love, as Vincent so loved the world that rejected him, as he so longed to be home in the church, the only building without light. The work of art that God used to grab my attention that day, could also be considered a genesis print, though not necessarily one with explicit and intentional Christian content. At that time, almost no one would have described me as a Christian and quite possibly the artist was not Christian either. Yet, I am certain that, within my encounter with that artist, through his beautifully created image, I also had a genesis encounter with God. The print shown above is called Hara. Rooftop Reflections of Mt. Fuji, by a well-known Japanese master named Jun’ichiro Sekino. He worked in the Japanese tradition of sōsaku-hanga (lit. creative prints), a 20th-century offshoot of the ukiyo-e (lit. pictures of a floating world) wood block printing movement. Hara is part of a series entitled 53 Stations of the Tokaido. The Tokaido is a road that runs the length of Japan’s main island. The names of the stations are taken from the 53 Buddhist wise ones visited by an acolyte named Sudhana. Numerous Japanese artists, including Sekino and Hiroshige (the most famous Japanese wood-block artist), have followed the same path, executing some sort of image at each station. The entire process is seen as a metaphor for Sudhana’s—and presumably the artists’—quest for enlightenment. Given that religious context, it may be safe to assume that Sekino, who died in 1988, was Buddhist. If there is intentional religious expression in the print, it most likely would have arisen out of that world-view. Regardless, I wanted to buy one, but as a “starving” college student I could not afford to buy the print. Eleven years later I ordered one from the artist’s US representative in Seattle. It remains my favorite work of art of any period. Period. Done mostly in shadowy grays and blacks it depicts the rhythmic lines of a ceramic tile roof on a structure at the base of Mt. Fuji. The print was made in 1964, and has strong, simple and graceful, graphic lines. Subtly reflected on the roof is the faint but easily recognizable image of the mountain—Japan’s most famous geographic landmark—upside down. Perhaps the reflection is due to a light coating of rainwater on the roof, or perhaps it is an artifice of the light itself, manifest on clay tiles. On first viewing, the image is pleasant, but vaguely disorienting. Mt. Fuji is not immediately apparent, yet one has a mild urge to turn the picture over—it must be hung wrong. Once the viewer recognizes the outline of the mountain, the questions begin. Surely there is no angle from which to view a roof on which Mt. Fuji could be seen upside down in reflection. After some experimenting with mirrors I determined that it is not an optical illusion, but that given the right perspective the image can be seen exactly the way it is presented in the print. The optics are possible solely because the roof is right at the base of the mountain, and because the mountain is gargantuan, dwarfing everything around it. It is a graphically appealing, nearly abstracted image, but what exactly is it that evoked such an overwhelming emotional and spiritual response in me? Japan is a nation of perhaps 50-70% atheists. The predominant belief systems are either Buddhist or practices (even among the atheists) that are heavily influenced by Buddhism. Less than 1% are Christian. Among the religiously inclined, Mt. Fuji is considered sacred. Similar to the way the Greeks regarded Mt. Olympus, Fuji is revered by many as the source of all good that is Japanese. Mt. Fuji is alone not simply in scale but in location. At over 12,000 feet, it is not only the highest mountain in Japan, but no other mountains are even near it. It reigns supreme above the landscape and plays a dominating role in the Japan’s cultural and religious mindset. In the shadow of the mountain are in excess of 1500 religious cults, some offshoots of Buddhism, some Shinto, some peaceful and some exceedingly evil such as Aum Shinrikyo, the doomsday cult that concocted sarin gas in warehouses at the base of Mt. Fuji and released it in the Tokyo subway system in 1995. They killed thirteen people and injured close to a thousand more. When I first looked at the piece thirty years ago this verse immediately popped into my mind: “For now we see through a glass, darkly; but then face to face: now I know in part; but then shall I know even as also I am known.” (1 Corinthians 13:12 ) I was in some philosophical turmoil at the time, trying to decide if I was going to be able to become a Christian. By God’s grace I was cautiously beginning to recognize the truth, but like so many people, I was struggling with the issue of how all the rest of the world’s religious experience fit in to the big picture. You know the questions. How can a loving God send someone to burn in the flames of Hell for eternity when they never even had a chance to hear about Jesus in this life? Whose fault was it that they were born in a place where everyone was Islamic, or Hindu, or Buddhist, or atheist and were taught from childhood that those perspectives are the whole truth? Somehow, in this obscure work of art I heard—apprehended, understood, received knowledge, however you wish to describe it—God speak to me. I received an impression on my heart that the apparently unresolvable conflict of a multiplicity of religious beliefs and practices had been resolved. The idea of seeing through a glass darkly came through with ironic clarity. Certainly, as Christians we want to believe we have access to the best understanding of these issues, thanks, not to our own reasoning (well, that too) but primarily to the grace of God’s revelation. Yet, even in the face of the marvelous gift of revelation in Scripture, we still see only “as through a glass darkly.” More importantly, and also owing to the grace of God, neither our correct interpretation of Scripture, nor our well-reasoned understandings of theology and doctrine are what saves us. Instead, our salvation lies in the reality that the One whose throne is the heavens and whose footstool is the earth became a human being and took on himself the punishment for all of our sin—his intervention, not our striving. We are at the mercy of his initiation, just as I believe He initiated a conversation with me, through the medium of an unassuming Japanese wood block print—a conversation that continues even today. Consider also that tiles are made of clay, just as human beings were created out of clay. We are, in part, created out of the mud, the baser “stuff” of the universe, and yet it remains possible to see the imprint, or the reflection, of the Creator on that. 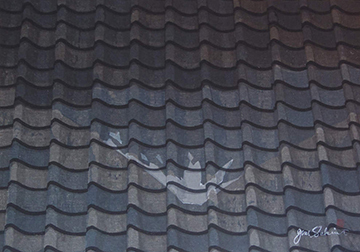 Consider further that the image is one of a roof. A roof is a covering, protection from the elements. A roof covers a house, forming a place of refuge, safety, and, one hopes, a place where relationship grows. I could go on, but you get the point. There are layers upon layers of revelation in even the most ordinary things, and when art serves its purpose and we are receptive to it, the layers can multiply exponentially. Joni Mitchell sang, “Every picture has its shadows; and it has some source of light.” Thus far I have written of the light within the print. In deference to the depth of the artistic expression in Hara, as well as God’s artistic expression in the natural world, I will write of the shadows and their necessity if we are to grasp the “deeper value and true significance” of either a work of art or the natural world. 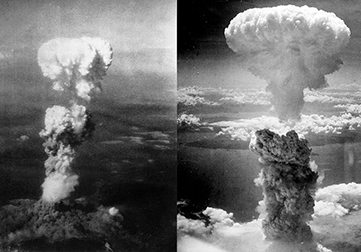 As part of that, I will reflect on the 68th anniversary of the bombings of Hiroshima and Nagasaki.